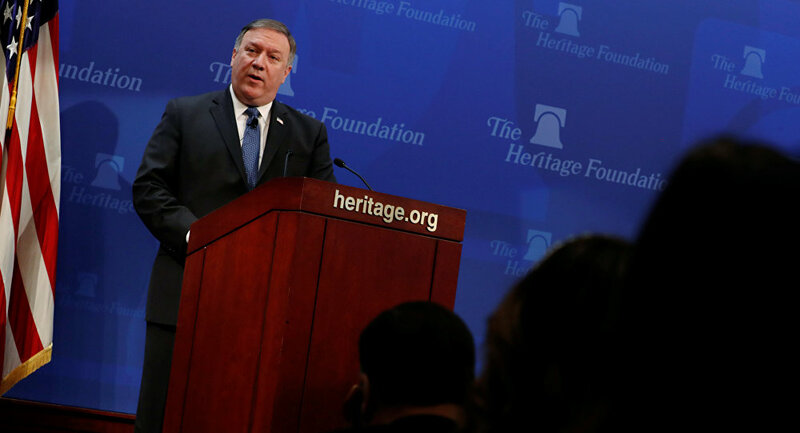 WASHINGTON (Sputnik) - More sanctions against Russia under the Countering America’s Adversaries Through Sanctions Act (CAATSA) are waiting to be introduced, US Secretary of State Mike Pompeo said in a congressional testimony on Wednesday. "There have been significant sanctions imposed under CAATSA, and I know that there are many more in the queue," Pompeo told the US House of Representatives Foreign Affairs Committee. As US Secretary of State Mike Pompeo explained, Russia represents a challenge for the strategic interests of the United States. "We know Russia poses a challenge to our strategic interests and the security of our allies," Pompeo said. "This is evident from the chemical weapons attack in the UK, for which we imposed consequences in concert with several partners and allies." Pompeo went on to say that Moscow must honor its commitments under the Minsk agreement with regard to Ukraine. He also said Russia has a duty to press Syria's President Bashar Assad to halt the use of chemical weapons, though Damascus denies involvement in any alleged chemical attacks in the country. "As a guarantor of the Assad regime, Russia has a responsibility to be a constructive actor for stability and peace in Syria, which includes stopping the regime’s use of chemical weapons," he said. "We are holding Russia accountable to its commitment to the Geneva process." During the presidential race and after his victory, US President Donald Trump repeatedly said he wanted to improve relations between Russia and the United States. However, relations between Moscow and Washington have recently reached what Trump has called their lowest point. A number of issues, such as the Ukrainian crisis, several rounds of Western sanctions and unsubstantiated allegations of Russian meddling in the US presidential election have cast a shadow over ties between the two nations. On January 29, the United States began imposing sanctions under Section 231 of the CAATSA on foreign entities and individuals who conduct major transactions with the Russian defense or intelligence sector. Congress passed CAATSA in July 2017 in response to allegations that Russia sought to influence the 2016 US presidential election. Russia has repeatedly denied the allegations of interference in the US political system, saying such actions go against the conduct and principles of its foreign policy. The top US diplomat official has touched upon the issue of the upcoming meeting between US President Donald Trump and North Korean leader Kim Jong Un, set to take place on June 12. Pompeo stated that the United States will not agree to a bad deal with North Korea and will walk away from talks if a suitable agreement is not an option. "We are clear-eyed about the regime’s history. It’s time to solve this once and for all. A bad deal is not an option. The American people are counting on us to get this right," Pompeo said. "If the right deal is not on the table, we will respectfully walk away." Pompeo called the denuclearization of North Korea a top national security priority and emphasized that the international sanctions campaign is "bearing fruit". "This campaign has been undertaken in concert with an unprecedented number of allies and partners," he added. "Our posture will not change until we see credible steps taken toward the complete, verifiable, and irreversible denuclearization of the Korean peninsula." As the US Secretary of State explained, Washington's goal in the dialogue with North Korea was to put an end to both Pyongyang's nuclear and missile programs. As he specified, it includes related technologies, in particular: engines and systems associated with space launch vehicles, in addition to missile programs. Pompeo stated that during his meetings with Kim, the North Korean leader asked for economic help and security assurances from the international community in return for denuclearization. "He made clear it was important to him that … when those objectives [on denuclearization] have been achieved, that he would in return receive economic help from America in the form of private sector businesses knowledge and know-how. From others – perhaps contributions, foreign assistance and the like, and that he wanted security assurances from the world," Pompeo added. According to Pompeo, the meeting between Trump and Kim is still scheduled to take place on June 12, and preparations are underway with that date in mind. On Tuesday, Trump said during a joint appearance with South Korean President Moon Jae-in that the summit with Kim could happen as planned, but conceded it could also "happen later." The US Secretary of State has mentioned the issue of the funding meant for the Syria Civil Defense volunteer organization — also known as the White Helmets, saying that Washington is trying to get other countries to provide support for the organization. "The entire $200 million of that funding is under review. I understand that there is a decision pending, I don’t know what that decision will be and I don’t want to talk about the internal discussions that we had," Pompeo said. "We’ll have a decision shortly." Moscow and Damascus have accused the White Helmets of helping to stage a chemical attack in Eastern Ghouta’s Douma on April 7 that prompted the United States, UK and France to launch more than 100 missiles on multiple targets in Syria one week later. The Syrian Civil Defense volunteer organization considers itself a non-governmental organization aimed at protecting Syrian civilians. Syrian President Bashar Assad said the White Helmets are being affiliated with the al-Qaeda* terrorist organization. US Secretary of State Mike Pompeo has also touched upon the Nord Stream 2 pipeline project, saying that the United States should continue to push for an end to it. "We should continue to push the Nord Stream 2 to be ended," Pompeo said during testimony before the US House Foreign Affairs Committee. Pompeo stressed that it may be difficult for European countries to push back against Moscow because of their reliance on the Russian energy supplies. Nord Stream 2 will have an annual capacity of 55 billion cubic meters of gas. The pipelines will be laid under the Baltic Sea and run from the Russian coast to a hub in Germany, bypassing Ukraine. The project is a joint venture of Russia’s Gazprom with France's Engie, Austria’s OMV AG, UK-Denmark’s Royal Dutch Shell, and Germany's Uniper and Wintershall. Several Eastern European states oppose the pipeline fearing Europe’s increased dependence on Russian gas and losing transit revenues, while the United States seeks to promote its own gas companies on the European market. According to 2017 Countering America’s Adversaries Through Sanctions Act, Washington may impose sanctions on competitors, including Nord Stream 2, in order to prioritize US energy resources. US Secretary of State Mike Pompeo went on speaking about the recent Caracas’ decision to expel American diplomats. "With respect to Venezuela, we did this morning receive a formal notification that our chargé d’affaires became PNG (persona non grata). We will respond appropriately, certainly reciprocally, but perhaps more than that, perhaps proportionately," Pompeo said. "We understand that the second US officer who will also be a PNG. We are well aware, we are watching the Maduro regime continue to engage in destructive behavior for the Venezuelan people." The comment was made in wake of Tuesday's announcement by the Venezuelan government of their decision to expel US Charge d'affaires Todd Robinson and Deputy Head of Mission Brian Naranjo from the country. Caracas condemned what it called "a systematic aggression campaign" led by the United States, which it accused of attempting "to punish the Venezuelan people for exercising their sacred and legitimate right to vote." On Sunday, Venezuela held its presidential election, with four candidates in the running. According to the National Electoral Council, Maduro was re-elected as Venezuelan president for the second term, having secured 68 percent of votes, with slightly over 46 percent voter turnout.